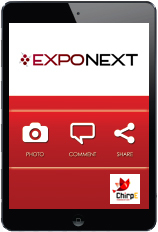 ChirpE Photo Booth is headed to ExpoNext 2014 in Baltimore this week to provide event attendees with a memorable experience, and an opportunity to participate in an exciting contest to win an iPad mini. The official social photo booth for the event will be available in Booth 201. To enter the iPad Mini contest, attendees just need to click a selfie at the booth, provide their email address and get the most “likes” on Facebook by midnight on July 14. It’s that easy! In addition, all EXPO Rising Star and E.X.C.I.T.E. Awards honorees will get the opportunity to see themselves on the cover of EXPO Magazine with the green screen photo booth at the award ceremonies. All the photos will be posted to the ExpoNext Facebook page and tweeted with event hashtag (#ExpoNext2014) live from Baltimore. a2z is exhibiting in Booth 203 at the event. Visit to learn how the ChirpE suite of solutions can help you attract and engage your audiences. We are looking forward to this exciting event and hope to see you there!